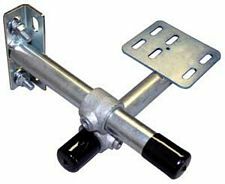 Adjustable bracket bolts to the side of any conveyor and is ideal for mounting photoeyes, scanners, reflectors, proximity switches, and other automation devices. It’s built with slotted holes on the mounting plate and bracket for easy mounting of scanners and other equipment without drilling, which can save significant time on conveyor installations. The key is completely flexible, 4-axis adjustability. 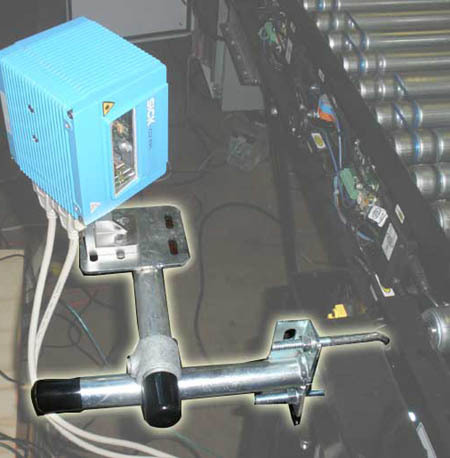 With 7" device arm adjustment, 9" cross mounting bracket arm adjustment, and 360-degree rotation of both, aligning devices to read barcode scanners is very easy. You can easily raise, lower, or rotate as needed for your application. Constructed with zinc-plated finish, high quality hardware, and black plastic end caps for a smooth finish. Larger quantities may have longer shipping lead times. Reflector Bracket Size: 3.5" x 4"
Package Stop - for 1 in. flange - 18 in OAW.